Travelling from Colombo and passing Pinnawala I continued travelling in eastern direction and had crossed the centre of Sri Lanka when I reached Polonnaruwa. The ancient city of Polonnaruwa is an important site in Sri Lanka and has been declared a World Heritage site by UNESCO as it is home to the ruins of an ancient Sri Lankan kingdom. The ruins of Polonnaruwa date back to the Golden Age of Polonnaruwa when King Vijayabahu I declared it the capital city of Sri Lanka and built his Royal Palace there. 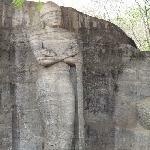 Today there are still remains of that palace and you will also find a statue of the king's grandson, Parakramabahu, who became king in a latter period and gave order to built some of the structures still visible today like the Polonnaruwa Vatadage which is believed to hold the tooth relic of the Buddha. 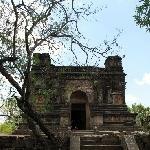 A vatadage is the kind of structure that is built to hold sacred relics like the above mentioned and is often built around a stupa to make sure that it is protected. 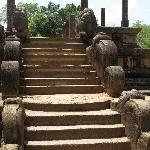 The Polonnaruwa vatadage has several entrances which are decorated with beautifully carved out half circular stones lying at the beginning of the stone stair steps and which are known as Sandakada pahana or Moonstone. I found the ancient city of Polonnaruwa to be a very impressive visit and the tour helped me understand more about the history of Sri Lanka and the religious traditions important to its people. 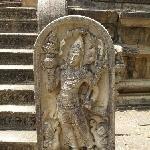 Did you enjoy Ancient City Polonnaruwa Sri Lanka Tour and have you been on a holiday in Polonnaruwa, Sri Lanka? Where to stay in Polonnaruwa: The Giritale hotel is a beautiful 4 star Hotel which I would truly recommend.